Living in East Idaho no matter what direction you go you will find an adventure. Just 2 hours South East of Idaho Falls you will find the home of Napoleon Dynamite in Preston, Idaho. I also found out of a Lil Place called New York Deli Strip Steak House. 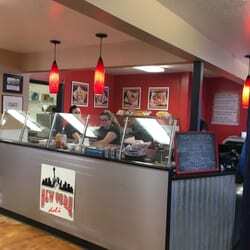 It is an authentic NY Style deli and Steak House, located in Preston, Idaho that serves Fresh baked breads and smoked, slow cooked meat. They have a wide range of food choices on their menu. Unique sandwiches, cuts of meat, classics, gourmet choices, salads and desserts! They have been in business for 3 years in Preston. On Tuesday they have ALL YOU CAN EAT WINGS so if you love wings plan to go that day! They also have a SPICY wing challenge. They are so hot, just the smell alone might burn your nose hairs. Even if you attempt you will be put on their wall of Hot Wing Challenge. The current record holder is a woman who ate 43 spicy wings. There was a lot of men’s pictures but the ladies came in 1st Place. Another fun challenge they have is a Monster Meat. You pick your sandwich with the meat of choice from pulled bbq pork, roast beef, turkey, ham, etc. The choice you make they pile on 3.5 lbs of it. If you become the record holder you get a free sandwich weekly till someone beats you. The current champion holds the record at 12min and 47 seconds for eating 3.5 lbs of meat!!! All light sandwiches include ribbon fries or fruit, and pickle spear $7.99 ½ sandwich with an 8 oz soup, pickle spear, and ribbon fries.